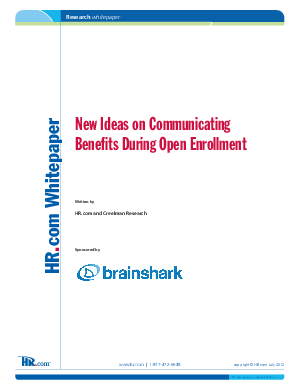 Getting employees to understand and take advantage of benefits during open enrollment periods is big challenge for many HR managers. This paper looks for new ideas on communicating benefit plans from professional marketers, knowledge management experts, and social media gurus. Learn about marketing principles such as targeting the right audience, drawing them in, and measuring results. Plus, find out how to effectively reach employees through multiple channels including video and mobile communications to increase engagement and retention.